I apologize for the length of time since my last post. I managed to get a firing in between some of the spring fronts that race through this time of year. I once lost the better part of 2 month’s work when a storm came out of nowhere with high winds blowing down the chimney into the kiln. The pots were at about 2,000 degrees F and I heard much pinging and cracking as cold air met hot pots! I look forward to those long drawn out high pressure cells that linger over the southern USA and provide long periods of stable weather because that’s the time for a wood-fired groundhog kiln. 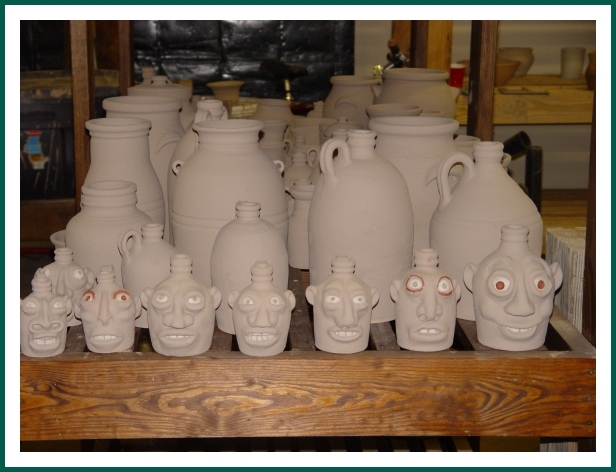 This is a photo of some of the small-medium face jugs after dipping them in glaze and before they were fired. They turned out real sweet and sold real fast. My camera has not yet been repaired so I’m behind on photos and real lost without it. I usually put 3-4 of these cone plaques around the inside of the kiln when I fire. They provide a record of the temperatures in various parts of the kiln. I do good to see one set when I fire due to the intensity of light, but I can see one set close to the front door. This helps guide me in determining when to halt firing. The cones are numbered, the higher the number the higher the temp it melts at. Here I wanted to get to 2,300 F (the middle cone 10) but waited until the 11 cone bent before stopping to insure the temp in the back had time to get high enough. Additionally, I go by color and I also hope to see what looks like shimmering drops of water on the outside of pots. This is the melted glaze and means I can stumble around like a real tired zombie and start closing the kiln up! Ya-hoo! Bed, sleep! I knew you would be back sooner or later. Those are some funky face pots, very cool. Can’t wait to see how the glazes turn out. I haven’t set foot at the wheel since I jacked my back up several months ago. 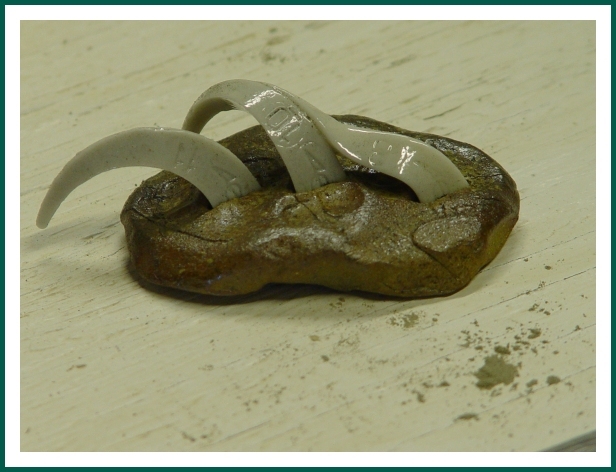 I can feel a whirlwind of claywork building up though. My last firing totaled twenty seven pots in the raku kiln. It doesn’t seem like a lot until you consider I was having to do them one and two at a time. That’s a lot of opening & closing & bending over for a geezer like me. I would love to see those pots, Slaghammer. I know they’re 27 beauts! I’m going to find a way to get me one of those darlings, yes I will my pretty…I’m sorry to hear you haven’t been back at the wheel, Slag. I hope your back is getting better. I know how much you miss that stinking mud!